before we were able to acquire some cuttings but now we have some fine plants flowering well, covering the bush with unique flowers in late November. 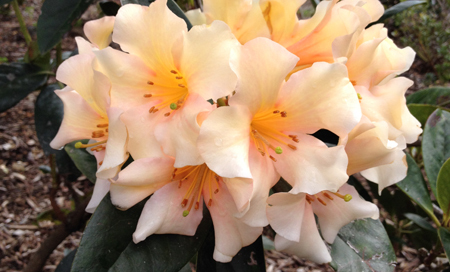 Wilson first introduced Rhododendron stamineum to western gardens in 1900 from Hupeh, flowering fourteen years later. He introduced it again from Sichuan in 1910, with other collectors finding it growing in Kweichow, Hunan Anhwei and Kwangsi.